A trip to Patagonia is an adventure into nature, and we expect all of our guides, drivers, tour leaders and staff to brief our customers on how to respect these fragile environments. 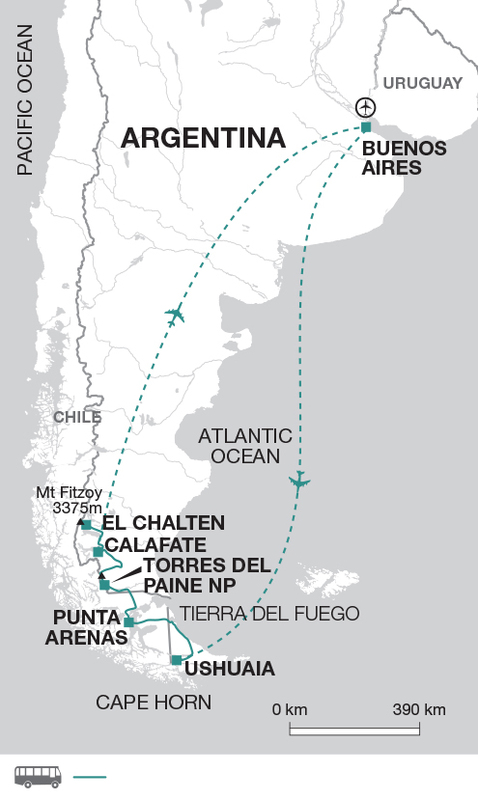 The trip includes visits to three of Patagonia's most significant National Parks - The Tierra del Fuego and Parque Nacional los Glaciares, and Chile's Torres del Paine, as well as exploring the pristine Huemel Reserve near Chalten. In each location the tour leaders and guides are trained to understand best practice in wildlife and nature protection. They will brief customers to keep all waste with them until back in the town, to walk only on designated paths and not to disturb the natural environments. Patagonia also has a good reputation for its drinking water, so we also encourage customers to fill up their reusable water bottles from the tap. The excursions on this trip are all taken by boat or on foot - for example hiking in Mt Fitzroy or Torres del Paine, and exploring the Beagle Channel or viewing the Perito Moreno Glacier. This offers a low-carbon way to get around, as well as getting us closer to the Patagonian nature, which is such a draw to the area. Our Patagonia trips concentrate on the outdoors, and some, in particular the glacier excursions at Ushuaia and the Vespigiani Glacier, are incredibly educational in promoting environmental awareness. The receding glaciers are a stark reminder of the importance of practicing sustainability both at home and abroad, and the Tour Leaders highlight this point while with their groups - this sparks off some interesting discussions over the dinner table! We use an Argentinian Tour Leader throughout our Patagonia trips, and in addition to this they are supported by local guides within each of the National Parks. They are trained and licensed to guide in the area, and are incredibly knowledgeable about the environment and the local communities that they work in. We make sure that our Tour Leaders and guides are working with a fair wage, in good working conditions, and that they are fit and well to work outdoors in what can be harsh conditions. We source locally-owned and operated accommodation, such as the Villa Brescia hotel in Ushuaia, who's owners have lived in the area for over 40 years, and our staff direct customers to eat in local eateries as much as possible, encouraging our groups to discover the fantastic food and wine that Argentina is famous for.